Coconut oil has long been known to be healthy for your entire body both internally and externally with more and more people using it as a main part of their skin and hair care regime. Before reviewing some of the best coconut oil brands for skin and hair, let’s have a short look at its benefits. Some skin benefits of coconut oil that people review about is helping with acne and acne scars as well as dry skin, moisturizing deeply and treating sebhorreic dermatitis. Nevertheless, keep in mind that although coconut oil can be beneficial for acne, it is not recommended for very oily skin since it clogs pores. Clogging pores is not good for acne prone skin, and although coconut oil has antibacterial properties which are beneficial for acne conditions, you have to actually try and see for yourself whether coconut oil can help with your acne. Coconut oil has a lot of other uses as well including dealing with frizzy hair, deep conditioning hair, healing cracked lips, removing eye makeup, clearing up diaper rashes naturally and more. It is also widely used by people who make DIY homemade skincare and hair care products such as body butters, lip balms, exfoliating scrubs, face masks, shaving creams, skin lotions and others. For those of you who are looking for a high quality coconut oil, here are some of the best coconut brands for your skin and hair. 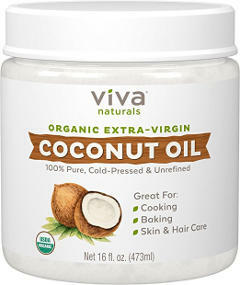 This Viva Naturals coconut oil is 100% pure, unrefined, USDA organic and non-GMO. It can be used both internally and externally as it contains no chemicals or additives and comes in a 16 ounce jar. Consumer reviews for this product are exceptionally good. Users say it is highly moisturizing, smoothes their skin, clears up their complexion, and even helps to reduce acne breakouts. It can also be used for a number of other skin and hair care purposes such as dealing with after shave irritation, facial moisturizing as well as for making home bath soaps and other skin care products. 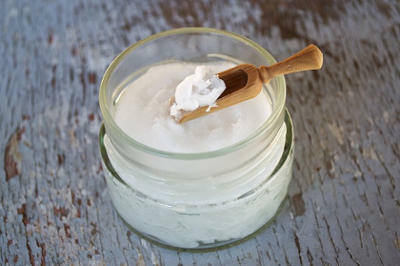 In addition, people use it either alone or with other oils to make a deep conditioning mask or a nice hair conditioner. It leaves their hair shining and less frizzy. An unexpected benefit that some users talk about is that it helps to ease the dry skin of their pets. 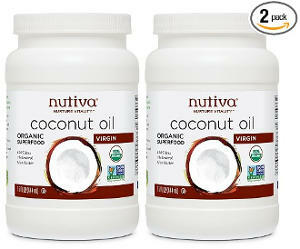 This 2 pack of Nutiva Organic coconut oil amounts to 30 ounces of virgin coconut oil which can be used internally or externally. This product is unrefined, USDA organic, non-GMO and non-hydrogenated. Nutiva is one of the leading brands in the production of organic coconut oil and is B Corp and Green Business Certified. Also, 1% of their sales is donated to agriculture activities that are sustainable. 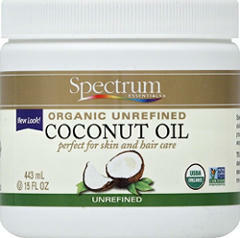 Their coconut oil gets exceptionally good ratings from consumers who use it for different purposes with great results. It works as an all over skin moisturizer softening that rough skin on elbows and knees while it also moisturizes hair as well as scalp and helps to reduce dandruff. In addition, it can be used for face washing leaving your face soft and glowing, and makes a great lip balm. 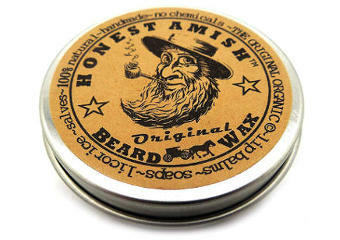 Users find that it works perfect when shaving or softening those whiskers, allowing their razor to glide. 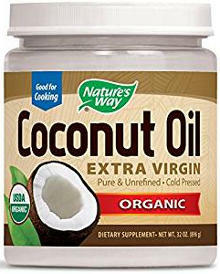 This Nature’s way Extra Virgin Coconut oil comes in a 32 ounce plastic jar and can be used for your hair and skin as well as a dietary supplement or for cooking. Moreover, it is unrefined and cold pressed. Product reviews are extremely good with users saying that this is great for dry skin and cracked lips, but also makes an excellent hair mask and conditioner as well as a shaving cream for face and legs. It has antifungal and anti-bacterial properties, and people with Sebhorreic Dermatitis state that it helps to relieve dry scaling skin. It softens the skin and leaves hair softer and healthier as well. 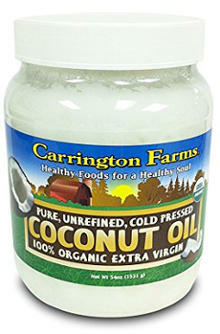 This Carrington Farms Organic Extra Virgin Coconut oil comes in a large 54 ounce container which is hexane and BPA free. The oil is cold pressed, pure and unrefined. It is also free of GMOs and does not contain gluten. Ratings and reviews are extremely positive with consumers finding that this product is a great moisturizer and carrier oil. They use it to remove make-up, when shaving face and legs, and also to make their homemade soaps as well as skin and hair conditioners, and even as chap stick to keep their lips moist and kissable soft. They are also very pleased to discover that it works well in resolving all types of skin problems in dogs and other pets. 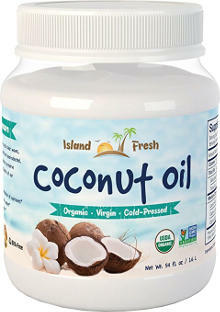 This Island Fresh Coconut oil comes in a large 54 ounce white jar that is BPA free. It is cold pressed, extra-virgin and USDA organic. 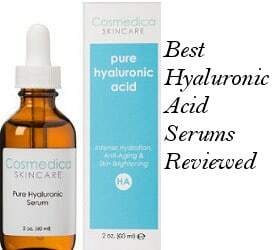 Product ratings are extremely good with users reviewing that this oil moisturizes their skin well and helps prevent acne breakouts. It also leaves the skin glowing. People love using it in homemade soaps as well as other DIY skin and hair care products. A little bit of this oil goes a long way and as related to hair use, it improves the appearance of dry hair leaving it soft and shiny. It also makes great deep hair masks worn overnight and shampooed out in the morning. This Majestic Pure Coconut Oil is different compared to the previous coconut oils presented before because it is fractionated and therefore can be used only externally. The fractionation procedure makes it last longer and it does not turn into solid like pure unrefined coconut oil even if the temperatures are low. In addition, it has no color, it is odorless and contains no parabens, sulfates or hexane in the plastic container. It comes in a huge 16 ounce bottle with a pump and is has a 60 day money back guarantee. According to the company, it is a great moisturizer and works well for skin irritations, rashes and skin inflammation while it can also be used to help deal with difficult skin conditions such as eczema, acne and psoriasis due to its anti-inflammatory and anti-bacterial properties. Lots of people use this product as a carrier oil to create their own skin or hair care recipes. According to them, it makes their skin soft and does not leave any greasy residue behind. It is also good for dry or frizzy hair and thickening up thin hair. Users like it as an all day moisturizer and as a makeup remover. 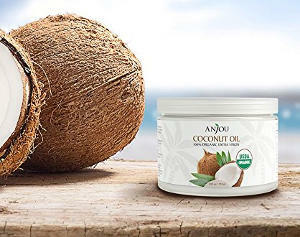 This Anjou Coconut Oil is USDA certified organic, extra-virgin, cold pressed and unrefined. It comes from non-crossbred coconut trees grown in Sri Lanka and is free of GMOs, trans fat, bleach and hexane. The company also offers a PDF file with 101 ways to use coconut oil and recommend it for deep hair and skin nourishment as well as for removing makeup. It can also be used for dog care. Users enjoy various benefits when using this product for their skin and hair care. It absorbs fast without leaving any sticky residue. It softens the skin and offers eczema relief, preventing scaling. It also works excellent on skin rashes. It may not get rid of acne completely but helps the skin be clearer. Relating to hair use, it results in less breakage and frizziness. People like it because it has a very mild coconut scent and men also use it to nourish their beard and make it more manageable. 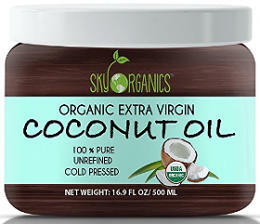 This Sky Organics Coconut Oil is USDA certified organic, fair-trade, cold pressed and Kosher certified. It comes in a BPA plastic jar free of BPA and apart from using it for your skin and hair, you can also take it as a supplement or use it in cooking. Due to its anti-fungal properties, it can work as a scalp treatment to combat dandruff and even lice while the company also recommends it for eczema, as a baby oil or even a mouthwash. People love this product’s texture and its great smell. It works excellent as a body moisturizer as well as to smoothen hands at home and remove makeup from eyes. It is also effective at softening the hair and keeping the scalp healthy. People use it to prevent shaving razor bumps or burn and love using it on their nails or to create their own homemade hair and skincare products. 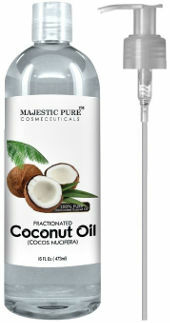 Pure Body Naturals Fractionated Coconut Oil has those common features that all fractionated coconut oils have. It has a long shelf life, stays in liquid form, it is odorless and can be used only externally. This product is free of parabens, phthalates and color, and is followed by a 3 month money back guarantee. It does not stain and is a carrier oil that doesn’t ever go rancid and doesn’t leave a greasy feeling. Some people like using fractionated coconut oil for their hair and skin more than the cold pressed coconut oils because it’s easier to use since it is in a liquid form and is contained in pump bottles. This product is reviewed by few people as a good option to use for flaky and dry skin as well as for body piercing scars and stretch marks. It does not stain clothes if you are using it for massages while it is also very much used in DIY products such as bath bombs and skin lotions. This Spectrum Essentials Unrefined Coconut oil is a 100% mechanically pressed oil that is free of preservatives and fragrance. The company recommends it for hair and skin care, stating that it has a rich tropical scent that smells natural. People have used this product for serious sunburn with great results. It’s also good for skin and hair care, getting rid of frizzies and softening the skin. You can get a nice facial massage using this oil but keep in mind that coconut oil is comedogenic so if you have oily skin, it’s better to avoid it. This product works well to get rid of those small red bumps after shaving and it is moisturizing but some people find its coconut smell too strong. 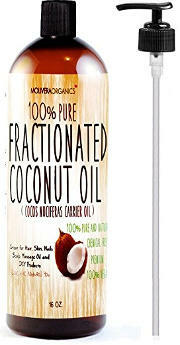 This Molivera Organics Fractionated Coconut Oil is odourless, colorless and free of hexane and preservatives. It is recommended for healthy hair and skin and is backed up by a 100% money back guarantee. Some positive feedback has been shared by users relating to this product’s ability to smooth out eczema patches and fade away age spots and blemishes. It is also used as a facial moisturizer and as a healthy treatment to leave hair moisturized and shining. Moreover, consumers like its price. 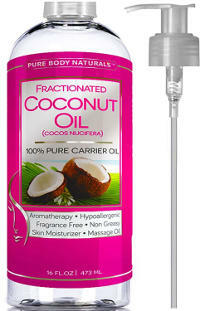 This ArtNaturals Fractionated Coconut Oil does not have any preservatives and is odorless. It makes a good natural carrier and massage oil and comes in a pump dispenser which is easy to use for your skin and hair. According to the company, the fractionation procedure of their oil makes it longer lasting and richer in antioxidants. It is also lightweight and non-greasy and has many skin and hair care benefits including sun protection, anti-aging, softening, anti-bacterial and moisturizing. It can also be used as a makeup remover and is good for smoothing out skin discolorations. Users review that it offers a non-greasy feeling and is non-staining. It protects from sunburn and actually helps to soothe dry sunburned skin. 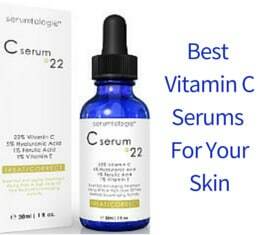 It moisturizes well every part of the face and the body and leaves the skin looking healthy and glowing. People also use it as a hair conditioner and a deep hair mask due to its hydrating and repairing dry and damaged hair properties. 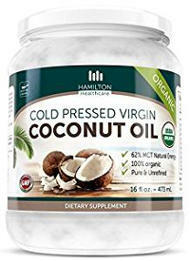 This Hamilton Coconut Oil is USDA certified organic and free of GMOs, bleach, deodorizer and hexane. It is suitable for hair and skin care and is followed by a 60 day money back guarantee. People like this product for their skin and hair but there were few negative comments about it not soaking well into the skin and being sold at a more expensive price than other quality coconut oil brands. In conclusion, here we have reviewed the best coconut oil brands for skin and hair with some of them also being suitable for internal use. Just remember that before buying coconut oil, you need to think of whether to go for the unrefined option or buy the fractionated coconut oil. We have talked about their pros and cons, so now it is up to you to decide which coconut oil suits your needs best.